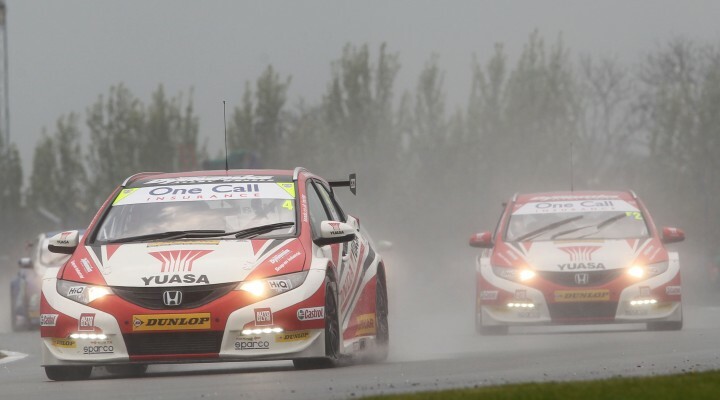 At last weekend’s Silverstone Classic, btcc.net caught up with Honda Yuasa Racing’s Matt Neal and Gordon Shedden to talk through their Dunlop MSA British Touring Car Championship seasons so far and look ahead to the remaining 15 races. “The start was fine, but the last couple of rounds haven’t gone my way. That’s the way it goes, but there’s still a lot more racing to be done, and for me the important thing is to score strong points for Honda in the Manufacturers’ and Teams’ championships. “It’s been good. I’d say we’ve sprung a bit of a surprise with the pace of the Civic Tourer – I reckon people expected us to take longer to get our heads around it. I don’t think anybody anticipated that we would come out of the blocks as competitively as we did. “From a personal point-of-view I’ve scored points in every race so far, which I’ve never managed to do before! You can’t underestimate the importance of that in the BTCC – and it underlines the consistency of the Civic Tourer, too. “I’ve managed to get onto the podium at some stage over each race weekend, which is a massive step forward for me. Historically it has tended to be over the second half of the season that I’ve got it all together – but this is the first time I’m going into the second half not on the back foot. “We might not have got the glory over the past couple of events – but we have been under the radar scoring some big points. Take Croft as an example – Colin Turkington stole the limelight with his two wins, but we actually scored more points than him over the weekend. Watch a video of our interview with Matt Neal from a very noisy Silverstone Classic here.